VELA Salsa 100 is a sit-stand chair with a shallow seat with tilt, which supports and stabilises the user. Has a delta seat as standard (B:46xL:35 cm) and an Ergo backrest (B:38xL:22 cm). The Delta seat (W:46xL:35 cm) is a shallow, ergonomically curved seat which supports and stabilises the user. Y backrest (W:37xH:30 cm). An ergonomic, curved backrest with good padding, which provides good, flexible lumbar support. The Y backrest is a low backrest, which allows for free movement of the back, shoulders and arms for various activities. Loose cover for seat. The cover is hygienic, washable and can easily be removed and washed in the washing machine. It is available in fabric or waterproof plastic, which is useful e.g. in the case of incontinence. Extra long armrest bar (41 cm long). Beneficial for tall people. The armrest bar allows for the armrests to be used as support, e.g. when getting into or out of the chair. A foot bar provides stability when the user is sitting high up and needs support for the feet. The brake pedal can be used instead of a brake lever or together with a brake lever. The brake pedal is located on the back of the chair and is foot-operated. The pedal is an advantage if a standing person has to brake the chair without unnecessary bending or compromising postures. VELA Salsa 110 is a sit-stand chair with a shallow seat with raised lip at the front, so the user avoids the feeling of sliding down the seat when it is tilted forward. VELA Salsa 120 is a sit-stand chair with an ergonomic, curved seat with V-shaped front edge, which ensures the user has support and plenty of space for their thighs. 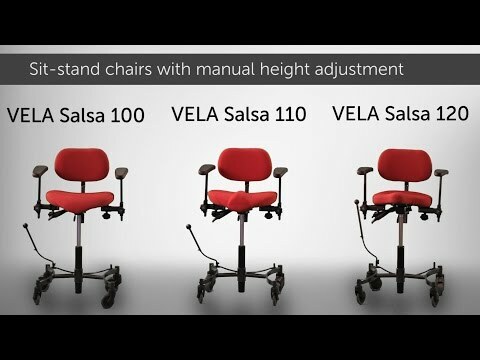 VELA Salsa 130 has an ergonomic, curved seat with V-shaped front edge, which ensures the user's feet are placed apart and therefore affords an active, stable and upright sitting posture. VELA Salsa 400 has a saddle seat which ensures an ergonomic sitting posture. The design of the seat allows for the natural curve of the back, providing an open, active hip angle.